[text_output]We use Interferential therapy which is a form of electro therapy that is used in the treatment of muscle pain and injuries. This type of muscle treatment makes use of mid frequency electrical currents on the muscle, which helps to heal injury and relieve pain. 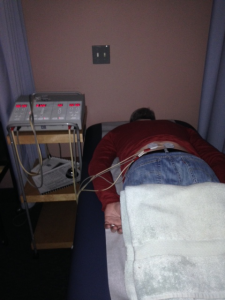 How interferential therapy works is that it creates a current that has a massaging affect on the muscle; this helps to stimulate the release of endorphins, which is a natural pain reliever made by the body. Not only does this help to relieve pain, but it also helps with healing injury to the soft tissue.